That’s rock-solid advice. On reading it, I thought about my own life. Has there ever been a time when I’ve been nervous about making an ask, and my fears came true? I couldn’t think of one occasion that happened. Just consider that. In 23 years, there hasn’t been one time in my life making the ask has had the negative consequences I’d imagined. It was all fear. Worse, I’d been pouring the fuel on that fire myself. To get anywhere in this world you have to be willing to put yourself out there, to make those asks, to say yes even if you’re scared. You have to push past the uncomfortable feeling that you’re inadequate, that you’re somehow unworthy of this opportunity. Don’t be happy sitting there meekly, dreaming about the type of life you’d like to be leading. 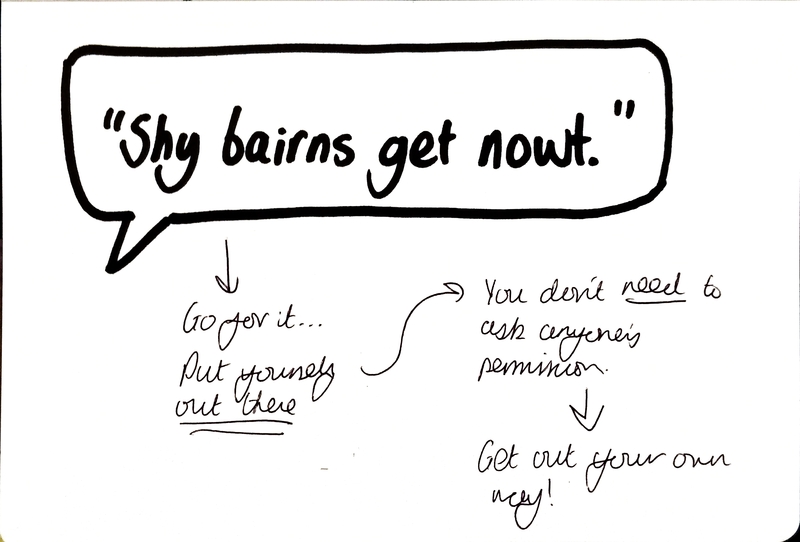 Don’t be a shy bairn. Go out there and live it. Sunday sketches. This is a cheery one. So, this morning I set the alarm, got up early, and ran to the seafront. Nothing like some interval training to shake up the negative vibes. Today’s been excellent. And it’s a reminder – mood follows action, not the other way around. Laying around on your phone is not the way to get motivated. In other news, I’m fast approaching 1000 views on the ink. What’s more, over half of them came this month. I can almost physically feel this thing picking up speed as the momentum builds. It’s incredibly exciting to feel every piece of writing, every drawing, contributing to this larger body of work. I’ve loved the process of creating. My writing and drawing is tightening up every day. I’m just so appreciative to everyone who’s taking the time to read along. I hope you’re getting as much from taking these posts in, as I am from creating them. Here are my top 5 most read posts so far if you’ve missed any. By the way, isn’t it interesting that sometimes the posts you didn’t think would strike a chord seem to really take off? How (and why) tidying your room will improve your life. Nobody’s listening. Here’s three reasons why that’s a good thing. I thought I’d compare our stats (I love doing stuff like that lol). That’s so interesting – I bet it’s crazy to look back at it now. I’m definitely learning it’s all about just showing up daily and putting in the work. I’m loving the community here though. It makes me want to come back for more haha!